I am about to fall asleep here, so let me just share my five favorite parts and the 10 toughest clues. Full names! Crossword-friendly Mr. Lahr is displayed as BERT LAHR, 2D: [Noted coward player]. I thought the clue was telling me he'd played Noel Coward until right now. And MARIO PUZO was a 49A: [Two-time Oscar winner for Best Adapted Screenplay]. Seasonal action! 31A: [Blizzard hazard] is a snowy WHITEOUT, while [Ripe] fruits and veggies are 38D: IN SEASON. 3D: If you're on a [High], you're feeling EUPHORIA. 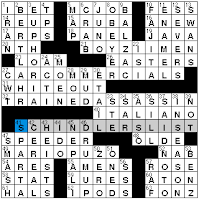 41A: SCHINDLER'S LIST is the [Highest-grossing black-and-white film of all time]. I still haven't seen it. It's really long, isn't it? Dentistry! 11D: [It's found on the cusp] clues ENAMEL, which covers the cusps of your teeth. 23A: LOAM is a [Brickmaking mixture], apparently. 55A: [They're often directed at shepherds] clues AMENS. Because...a pastor is the shepherd of her flock? I'm not sure about this one. 57A: [Either of two opposing war emblems] is a ROSE. Wars of the Roses involved the House of Lancaster (red ROSE) and the House of York (white ROSE). The War of the Roses is a very dark comedy starring Kathleen Turner and Michael Douglas. 5D: [It might tell you where you stand] refers to one of the "you are here" MAPs. 7D: JUNO is a [Pantheonic queen] in Roman mythology. 8D: [One who's not refractory] is an OBEYER. Not the finest -ER word out there. 13D: SWANS are the [Group of "nine-and-fifty" in a Yeats poem]. 27D: [43.359 kg.] is 100 pounds, or a hundredweight (CWT). 41D: The [Domain of King Tyndareus] was SPARTA. 53D: BENZ was the [Maker of the 1923 "Teardrop" racecar]. 17A. PONY EXPRESS [Delivery service of old]. Can you imagine how speedy that pre-FedEx service would have been had ["Horse of the Century" that won 20 of his 21 races] MAN O' WAR been alive and part o' that team? These days of course, E-MAILS, those [In-box fillers], probably provide the swiftest delivery service of all. And that's progress. 44A. WELFARE STATE [Nation that provides cradle-to-grave services]. I sure don't make that a crime. While definitions do support the clue Lynn's given us, I rather like the tone of the first definition here. 59A. WILLIAM TELL [Swiss folk figure renowned as an archer]. And the subject of an opera with one famously-recognizable overture. (Okay, the finale of the overture to be more precise...). Can you name the 3-letter canton Tell called home? It's a crossword puzzle staple. [Down in the mouth] for SAD, and then [Org. for looking down in the mouth?] for ADA (that'd be the American Dental Association). Cute, huh? [Terrible spelling?]. Well, that'd be HEXING. [Sandwich for Superman?] HERO. D'oh! A [Military vehicle in Iraq and Afghanistan] is a HUMVEE. I just hope the occupants of our [American H.Q. abroad], our U.S. EMBASSY in those places, is out of harm's way. [Many four-footed friends] are PETS and ODIE (which sits directly above in the grid) is not only a [Pooch in the paper] (in the comic-strip "Garfield"), but is one of central character Jim Arbuckle's pets (along with orange tabby cat Garfield). [Central quality] gives us the beautiful word ESSENCE, which may also be said to be the spirit of something. [Spirit] as in ÉLAN, however, refers to "enthusiasm, ardor, vigor." And speaking possibly for no one else but me... thank you, Lynn. The clue is [Bikini part] and the fill is not BRA. Woo-hoo! Let's hear it for TOP! 8A: [Not quite Barcelona's best?] clues NUMERO DOS (uno). 24A: [Four-handed piano piece by a French emperor?] is a NAPOLEON DUET. I know Napoleon Solo of The Man From UNCLE solely from crosswords. 37A: [Movie gigolo Bigalow struggling with debt?] is a DEUCE IN THE HOLE. Just the other day, Andrea Carla Michaels was telling me she used to hang out with Rob Schneider (of Deuce Bigalow fame/infamy) in his pre-SNL days. 52A: [Multitasking, but just barely?] is DOUBLE-MINDED. Although a single-minded person could well multitask, focusing on the goal of clearing a to-do list. I like the 9-letter stacks in the corners even though a third of those answers are theme entries and the others are of the same length. 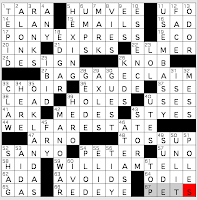 The SLEPT LATE/EARLY BIRD cross-reference is lovely ([Proverbial worm catcher]/[Hardly emulated the 16-Across]). My sister's given name is LAUREL and we were fond of Laurel and Hardy shorts, so I'm partial to the [Hardy partner] aspect of LAUREL. I didn't know that C MAJOR was the [Key in which "Chopsticks" is usually played]. When I filled that in, it wasn't yet obvious to me that NUMERO DOS was a theme entry, so with C MAJOR crossing the NAPOLEON DUET for piano, I was prepared to loathe a music theme. (Yes, I know, it's not likely that a 6-letter Down answer would be part of a theme.) Hooray for a solid wordplay theme instead. 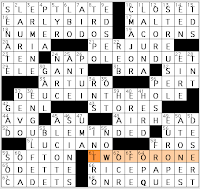 Brendan Quigley's blog crossword, "I'll Have the Number Two"
Brendan's juvenile theme is "words that mean 'poop' used in food puns." Are you working up an appetite for REESE'S FECES, a DING-DUNG, the POO-POO PLATTER, a CRAP CAKE, or the SURF AND TURD? I'm now in the mood for some Reese's Pieces, actually. The theme echoes the NUMERO DOS and DEUCE... answers in the L.A. Times puzzle, doesn't it? I couldn't rate this better than 3 stars out of 5 at Brendan's blog. Why? Because of REDOSE ([Up the medication]) and the upper right corner. I didn't know that [Nirvana's record label] was called DGC. I didn't know that Stephen REA was a ["Fever Pitch" actor, 1997], having not seen the movie. The crossing [Rotten egg] is CAD, but I think DUD could've worked too. 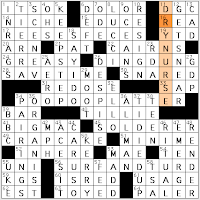 And then there's 11-Down, [Newborn attendant], with nothing in the clue saying "this is an archaic term." DRY NURSE? Really? Dictionary says archaic: "a woman who looks after a baby but does not breastfeed it". I've heard of wet nurse, nurse, baby nurse—never DRY NURSE. I did like the crossing of an EST(imate), clued as [Rough amt.] rather than [Ballpark fig.? ], with the ORGANIST who is a [Ballpark figure]. I did not care for the [Jack-of-all-trades at times, perhaps] clue for SOLDERER...or for that answer. [Like a jack-of-all-trades] is fine for DEFT, though. This is a 72-worder. I wonder if I'd have liked the fill better if Brendan had gone with an easier grid, say, a 76-worder. 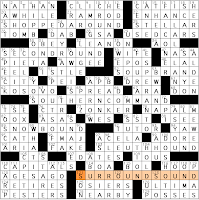 Liz Gorski's Wall Street Journal crossword, "Hear, Hear!" The SURROUND SOUND theme includes six other phrases whose beginnings and ends make an surrounding SOUND. For example, [Compared prices] clues SHOPPED AROUND. IN LA-LA LAND means [Out of touch with reality]. DO SHOTS is clued as [Throw back tequila]. ["I love you" is "Mi amas vin" in it] refers to ESPERANTO. Do you know Susan Chang, who talks about food on public radio and attends the ACPT? She has written Esperanto haiku on Facebook. Esperanto haiku! It's captivating. [They include lemons] is a clear-yet-not-easy clue for USED CARS. I like the word [Bloviates], which clues SPOUTS OFF. BUSY is clued as [Working class? ], while [Help for one in a class struggle] is a TUTOR. Crossword clues cloaked in Marxist misleads! "WHAT IS IT?" is a [Terse response when interrupted. I started out with WAIT A SEC, but a snappish WHAT IS IT is much more colorful fill. There were some unfamiliar things lurking in this puzzle. Like RAHU, the [Sun-swallowing demon of Hindu myth]—completely new to me. And my dictionary tells me that theme entry SLEUTH-HOUND, or [Detective with a nose for crime fighting], is a dated term for bloodhound or an informal word for an eager investigator. I thought the [Creole entree] was going to be a two-word phrase for some reason, but it's CATFISH; I needed that C for the unfamiliar CESS, or [Luck, in Ireland].